Understanding the evolution and challenges of creating and sustaining digital service teams in the public sector will provide useful context for future directions . Dr. Mergel interviews leaders and users of digital service teams in the US and internationally to learn how they operate, and the challenges they faced in creating a private sector-like “start up” culture within government to foster innovation and top-level tech talent. 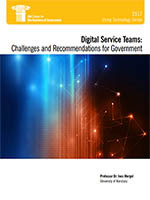 Her report identifies six challenges, and offers recommendations on actions that both digital service leaders and policy makers can take to ensure the sustainability and scaling of this novel approach in government. Read the Federal Times article. Read a Government Information Quarterly paper published by Ines Mergel that uses the interview data collected from 18F employees.